John Higgins will meet Ronnie O'Sullivan in the Scottish Open quarter-finals after both won comfortably in the fourth round. UK Championship winner O'Sullivan beat Michael White 4-1 and John Higgins eased past Ashley Hugill 4-0. Defending champion Marco Fu lost 4-3 to Xiao Guodong and Neil Robertson triumphed 4-2 over David Grace. Stephen Maguire, Cao Yupeng, Ricky Walden and Judd Trump also made the last eight. Higgins and O'Sullivan met at the same stage of the tournament in Glasgow in 2016, with the Scot emerging victorious with a 5-2 win on that occasion. He went on to lose the final 9-4 to Fu. O'Sullivan's power-napping during his last 32 win against Li Hang on Thursday afternoon caused amusement and he said there were times when "he was totally out for the count". Four-time world champion Higgins' passage to this year's quarter-finals has seen him beat Jack Lisowski, Christopher Keogan, Gerard Greene and Hugill. He has only conceded two frames in those four matches, and will face O'Sullivan in Glasgow on Friday night. 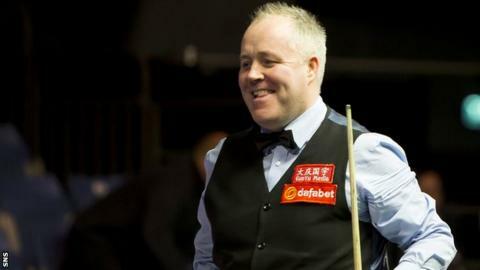 "I've been a little bit lucky because I've played a few players that have maybe not been accustomed to the main table," Higgins told BBC Scotland. "But obviously I'm now playing someone in Ronnie that's normally on the main stage. "I'm glad it's on Friday night because there was a really good crowd tonight. When I played him last year people said they wished it had been at night because they had been working. "Ronnie must be pretty tired because he's had a hectic couple of months and nearly been in every final. But let's hope I can put him to sleep tomorrow night." Maguire beat Xu Si 4-1 and faces Judd Trump in the quarter-final. "This would be the best tournament I could ever win," the Glaswegian told BBC Scotland. "Just for being where it is and who would come down to see me."